If your company uses letterhead every day or for important documents or mailings, you should be using professionally printed custom letterhead. 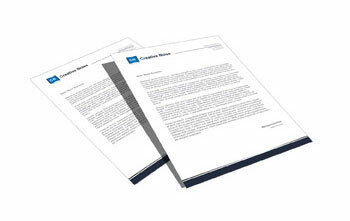 We’ll print your company letterhead on 70lb uncoated opaque text paper that makes each letter you send seem special. It’s twice the weight of copier paper, but it measures the standard 8.5” x 11” letter size and is compatible with laser or inkjet printers. You can use color on both sides of our professional print letterhead, so you can incorporate your color logo into your design. Color letterhead always stands out and makes for a premium presentation. Download our design templates in Photoshop, Illustrator or InDesign. The templates include digital specifications, making designing your letterhead easier and faster. One of the common issues with letterhead is a top heavy design. In today’s hyper-connected world, it’s easy for your letterhead to become cluttered with fax numbers, email addresses, web addresses, and landline and cell phone numbers. How do you decide what to keep? What if you want to fit all of that information in? The answer is surprisingly simple: use a footer. Adding a footer to your letterhead allows you to break up your contact information, relieving the weight on your header. While you’re adding that footer, you might want to consider the benefits of a second page footer. When you use NextDayFlyers, you can print letterhead in color on both sides. Try making your second page footer a shade of gray – it’s sharp looking! When you take the time to create top-notch identity materials, you’re investing in your bottom line. Because when you make a premium presentation to your clients using printed company letterhead, you can charge more. You’ll feel comfortable doing it, because your proposal packaging will give you confidence. And your customers will feel comfortable paying it, because it will give them confidence, too.